What is Research Verified Omega-3? This will be a review of Research Verified Omega-3. This product will provide the body the essential fatty acids (EFAs) it needs to properly function. A body which is deficient in Omega-3 is more prone to develop degenerative conditions and illnesses. By taking a supplement such as Research Verified Omega-3 an individual will be giving the body EFAs it needs and also maintains the body’s overall physiological health. The recommended dose for this product is 1 capsule two times a day. You should take each capsule half an hour before your meal with a tall glass of water. There are three types of packages you can select to purchase. You can purchase the: 1 Month Supply, 3 Months Supply, and 6 Months Supply. The most popular package and best valued one is the 6 Months Supply since you will save over 60 percent. Each bottle instead of being $48.00 will only be $24.00. When taking an Omega-3 supplement, you will gradually notice an overall improvement in your health. This is not something that will change overnight. Consistency will lead your body to a better state of health. It is also ideal you should continue taking this product to maintain your body’s health and give it the required and recommended amount of EFAs daily. You should not exceed the recommended dose. Taking too much Omega-3 can lead to adverse reactions. Please consult and speak with your doctor if you have any inquiries or if you are a woman who is pregnant or nursing, someone with an existing medical condition, or someone taking prescription medication. If you notice any adverse reactions while taking this product, immediately discontinue your use and speak with your doctor. 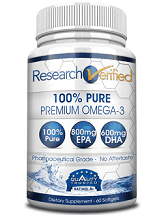 Research Verified Omega-3 comes with a 365 day money back guarantee. This means if you are for whatever reason not happy with the results you get with this product, you can return this product within 365 days of the purchase date to get your full refund. All you need to do is send all your bottles, opened and unopened back to the manufacturer and you will get your entire refund, minus shipping. Ideally when you are looking for an Omega-3 supplement, you want pure and potent ingredients which are not compromised with filler components. Research Verified Omega-3 is a product which delivers on this. Along with these high quality ingredients, this product comes with a very reasonable price, especially with the package options. Lastly, the stellar 365 money back guarantee is something which is very rare when it comes to companies. This means a customer has almost a full year to decide and determine if this product is right for them. With a guarantee such as this, we determined the manufacturer is confident in their product and its claims.